Gandhi Jayanti, 2018: I have been meaning to add some songs and other content for a while, but kept putting it off. Now, with some updates in blogger in recent years, I find the template I used to get the color-coded Pallavi, Anupallavi etc., doesn't work as well. So, for the time being, I am just adding all updates and songs to this page. The observant reader would have noticed the word-play in the name of this site, there is double-meaning. Tyagaraja-Darshana means both, a glimpse of Tyagaraja as well as, the philosophy of Tyagaraja akin to message, or Tyagaraja-mata. As I frequently mention, I use TKG's book a lot. I think, TKG and P. Sambamurthi pretty much covered all available sources that preceded them, such as the Adi series. TKG's Bibliography to his book is a very solid list. P. Sambamurthi covered just about everything possible for his biography. Together, the two subsume earlier "complete" anthologies like Rangaramanuja Iyengar's Kritimani-maalai volumes, and give a very strong foundation. There is not much more to be done with primary sources. So, in general, what more can be done, lies in terms of what new techniques that have not been used before that we could throw at these songs, like philology or data sciencc, than search for missing material somewhere, or see if new research has thrown up something, in the few Carnatic music journals there are. The choice and layout of some of the more graphic songs here, are, no surprises, inspired by the Tyagaraja Ramayana discourses of T.S. Balakrishna Sastrigal - because, like with him, the vivid descriptions Tyagaraja gives, are what would first strike the eye of someone analyzing Tyagaraja's poetry: e.g. Alakallata, Hecharika etc., whereas, in general we focus on Tyagaraja's philosophy, method and message, than on other things. We never touch upon trite or overdone topics in this site – like discussing Tyagaraja's raga choices threadbare – and prefer choosing new perspectives to develop. But, sometimes there’s use in touching such hoary, old chestnuts. Here’s one – though with some risk ol loose talk and poor recall due to the press of that thankless master, Time : The tempo of Tyagaraja’s songs. It’s said Tyagaraja’s songs are mostly in madhyama kaalam, as it is easier and has more mass-appeal, whereas Dikshitar’s songs are in chauka kaalam or slow speed, and it is not layman’s music but musician’s music. I recall reading GNB’s comments along these lines, in his president’s address to the Music Academy and his views on Tyagaraja were deeply studied and judiciously held. I don’t think “Madhyama is natural with layman appeal”, says all of it. Let’s look at the lyrics. Tyagaraja is often conversing, more lyrical, graphical, uses everyday dialect frequently. This cannot be done in slow tempo or fast tempo and sound normal. For an example, why go too far? Take: “Ela! Nee dayaraadu?” He’s conversing, and so the tempo fits. We just don’t find such frequent personal dialogs with Dikshitar or others. The highly ornamented, prolix style of Dikshitar, has to go slow. In his lyrics and his tunes, Dikshitar's approach is to pack a lot of nuance. This is can only be highlighted at slow speed. The other thing, which is often not considered in Carnatic music, but is analyzed in Western musicology, is that Dikshitar seems to have composed with the Veena in mind, or just composed often at the veena itself, and we get the slow, rich gamakams. Compare this with the usual remark that Mozart and J.S. Bach were violinist-composers and this tells in their music, whereas Beethoven and most others, certainly Liszt and Chopin, were pianists. There is a pinch of salt to add to any such generalizations. So many Tyagaraja songs have gotten modified, even bowdlerized in transcription, preservation and propagation, that we just may not have them in the original shape, showing his original intent. In about 10 years, this site has seen quite some traffic - unexpected, because this site is never advertised anywhere and doesn't link to any other sites, and its focus - message-in-music/musicology - is very narrow, even for the small Carnatic music community of which only an even smaller part is even online. At some point it crossed I think a million or two views, and for its coverage regularly appeared at the top of web searches. I suppose this was all before tweeting and selfies and instagramming got so big. I suspect traffic must have chilled a little these days as with all blogs in general. I am however, mulling a major revamp of this site, and moving away from blogger as well, if this project ties into some other Indological projects of mine that I have on the anvil. Let's see. Raaga-anuraaga - Attached to ragas. Raaga-praaganuraaga - Formerly attached to ragas. In our great Manichean contrast study between Dikshita and Tyagaraja, here's another thing that stands out. The standard lore is that Tyagaraja is a master innovator who brought us so many rare, never before heard ragas and usages, popularizing them single-handed. We mention a few on this site. Even in known ragas, he found so many new usages. There is even the question about "which" Abheri, the raga of the signature song of this site. He covered such a large spectrum rarely repeating himself across hundreds of compositions. Yet, amidst all such odes to him, there is enough reason to be skeptical, because the verifiable historical record is so scarce. The one or two reliable sources that do exist, like the notebooks of his disciples, do not give the raga signatures and full information, whereas so many songs have been rescored by later musicians and these versions have by now, become the norm. For many of the hard to verify songs, the earliest raga assignation comes from his earliest anthologists, who were on shaky ground in some cases. Often, we just don't know what the composer originally intended, if the lyrics do not spell it out. Such facts and the overabundance of discussion is why we often discuss other perspectives than ragas in this site, as we really try to be historically accurate. With Dikshita though, there is no such problem. He is much better documented in terms of historicity. 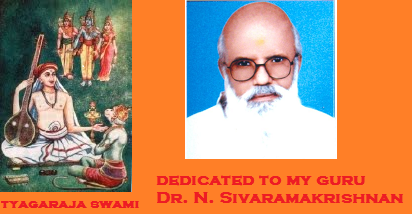 His direct descendant of course, wrote the landmark Sangita-Sampradaya-Pradarshini. His lyrical and compositional style often leave little doubt. Most of all, he himself, as a lyrical device, often specifies the raga name. This study in contrast between these two contemporaries just keeps going on and on. In the preface to the print form of this work, directly and elsewhere, including on this site, indirectly, I boldly claim that my verse English translations of Tyagaraja are the first real and comprehensive such translations and so unique. Well, many, many years ago, when I started English verse translations, having read a few such of the classical literature of the west, i.e. Greek and Latin verse, I was not aware of earlier attempts of verse translations of Tyagaraja. I came across them later. There have been 2 published verse attempts, one in 1937 and another in 1954. But, they are in no way comprehensive or comparable to the work you see here. The first is the "Songs of Tyagaraja" by C. Narayana Rao of Anantapur, a scholar of cultural studies, published by the Sarada Press, Madras, in 1937, containing 77 songs. The second is "Lines of Devotion" by A.V.S. Sarma, a pediatrician of Madras, in 1954, published by the Antiseptic Press, which I understand, published medical journals, containing 72 songs. Now, our work here, is complete in 2 ways. We cover ALL songs which are ascribed to Tyagaraja with some certainty. In each song, we omit nothing, covering every minute detail. What's more we maintain word order, line order and so forth, and use color-coding, to mark the various sections of the song, to suit all types of readers, from the explorer to the past-master. Then come the commentaries and the philological and statistical validation of the lyrics and development of theme and message that we do here. The first book above, is merely prose formatted into a verse form. The translations cover most of the detail in each song. It is in two page format, with the original song on the left, and the English on the right. The poems however, do not make for good reading, though, Indians writing in English at that time, generally had better turn of phrase and skill in idioms than now, when people seek the functional rather than the flowery. I have seen prose translations that read much better - but that's my opinion, and tastes differ. The second book omits too much detail in many songs, and is much too loose as a translation, and the author admits this. It is too far from being a complete translation to benefit readers of all levels of experience of Carnatic music. The author calls it blank verse, but I think, it is closer to free verse, like the first book. As for the quality of the poetry in these books, unlike metrical verse, no one can standardize free verse, to say, this is verse and that is not. Anything goes. But, then, only some works clothed as poems feel like good poems, and can be attested to as competent verse. This, is something any educated person can do - identify real poetry for what it is. I think, definitely in 1937, and may be in 1954 too, not all Tyagaraja songs available in print now, were available. Nor was his life history established with what accuracy we have now, which itself is not that high. You are welcome to compare our translations with these books. The first book doesn't have Nagumomu. So, here is "Raga-sudha-rasa-panamu" from it. Drink and take delight, O Mind. Drink the tuned nectar of his song. Yag and yog, tyag and bhog. Thy smiling face is missing long, O Ram! Come forgetting all discussion, distance long! Thou elevated Mount Govardhana as boon! Have Thy attendants spoken ill of me? Can’t Garuda run fast with Thee to me? Or does he find the distance too far? To none but Thee, the ruler of the world! Prana, the vital force lies in (pervades) the middle of the soul, Atma, and Dvani, the primordial sound pervades the middle of Prana. Naada, music, pervades Dvani, the primordial sound, and in the middle of Nada is Sadashiva, the divine. "Worship through music" is the familiar singing of hymns, devotional songs and so on, i.e. singing or playing music written expressly in praise of or supplication to the divine. In "Music as worship", the votary is forever immersed in musical activities as music is not just a path to, but a part of the divine. A simple Raga exposition with no words or thoughts, or even singing a song with no reference to anything devotional, say - "it's raining" - i..e the practice of music in any form - by extension, thinking about music, codifying music, imparting music - would all count as worship. Tyagaraja himself seems to have evolved from the first position to the second. He has written hundreds of songs of the first kind, praising Rama and other deities, to use for daily prayers, or when he offers a necklace of gems made of ragas to Rama as in "raaga ratna maalikache" and on other occasions, like the Ekadasi events he held. But consider the later, more mature songs like Nadopasance explained on this site. Tyagaraja himself spells it out. He says music empowered the divine. This is similar to the Pythagorean and other thinkers, as opposed to say, Baroque composers producing sacred music for church services, who would fall into the first kind. The difference is that between: "Use music to please the divine." and "Find music as the divine is inside it". In the first, music is a tool. In the second, music is an end in itself. Finally, calling the two "Music in worship" and "Music is worship" would have been more succinct. But, I used the more unweildy phrases to be more descriptive, in line with the translation practices I use on the website.